Each Christmas season a group of pilots and volunteers visit lighthouses and coast guard facilities up and down the coast of New England bringing gifts to the children. This “Flying Santa” tradition began in 1929 when pilot Bill Wincapaw of Rockport, Maine, the pilot of a float plane that delivered mail, medicine, and other essentials to remote coastal communities became lost in a fierce winter storm. With his compass malfunctioning and running desperately low on fuel, he was eventually guided home by a series of lighthouses along Pennobscott Bay. To show his gratitude, he and his ten-year-old son dropped floatable bundles full of presents to the families of the lighthouse keepers on Christmas Day. The keepers were so appreciative that The Wincapaws decided to make it an annual tradition adding new lighthouses each year. And that tradition lives on today, ninety years later. 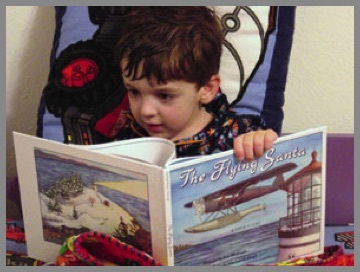 The Flying Santa is a book the entire family will enjoy. 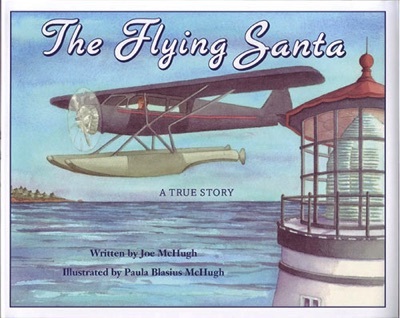 Written by storyteller and public radio producer Joe McHugh and illustrated by his wife Paula Blasius McHugh, the book follows the life of Bill Wincapaw from his boyhood love of flying, his close friendships with airplane designer Glenn Curtiss and noted aviator Charles Lindbergh, to that fateful night fighting for his life in the teeth of a winter storm and his efforts afterwards to repay the kindness of the keepers. It is a timeless tale about having the courage to follow your dreams, the importance of generosity, and the honoring of tradition. "My family reads The Flying Santa every Christmas, it has become a tradition with us. Wonderful story about gifting in the truest sense."